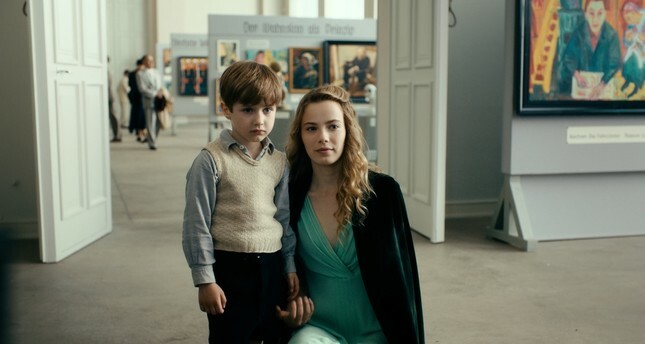 This week is promising to be an exciting one for cinema lovers in Istanbul as successful German director Florian Henckel von Donnersmarck's strong comeback with his film "Never Look Away ("Werk Ohne Autor"), will hit the silver screen on Feb. 8. Movie buffs may remember Donnersmarck for his sensational 2006 production "Lives of Others" ("Das Leben der Anderen") which earned him the Best Foreign Film award at the Oscars. After this astonishing success, Donnersmarck sat in the director's chair for the spy drama "The Tourist" in 2010, starring Angelina Jolie and Johnny Depp, which, I think, fell behind the perfection of its predecessor in terms of cinematography and plot. Now, with "Never Look Away" he may see a comeback as the film has also been nominated for the Best Foreign Film and Best Cinematography for the Oscars. Tom Schilling acts Kurt Barnert. Brought to the likes of cinema lovers by Başka Sinema, the film offers a complex narrative about how the Nazi regime and successor Soviet regime transformed the art scene, through the perspective of a young boy, who grows up and becomes an artist at the end of the 1930's, spanning a 30-year-story. The film opens with a little boy, Kurt, visiting an art gallery with his aunt Elisabeth, when a regime official belittles "degenerate art" and dictates to them that art should raise the soul, in line with Nazi principles. Elisabeth and Kurt like a "degenerate" Kandinsky painting, thus hold a secret not to be revealed in this strict regime where everyone's lives are in danger. A bad prophecy comes true and the rebel-soul Elisabeth is taken by the Health Ministry as she is deemed to be insane in an environment where citizens are expected to show no derogatory behavior. We witness a less-talked-about reality of the Nazi regime when she is sterilized and sent to a secluded dorm full of women with mental disorders who spoil the idea of "healthy Aryan race," just to find the end of her life in a gas room. Though the boy Kurt last sees his beloved aunt when she was taken by force from the house, he always carries her rebel soul and remembers her advice to "never look away" as she teaches him everything that exists is beautiful in its own way, which is highly romantic in this brutal era. What starts in the meaningful, blue eyes of the boy follows the audience throughout the film of more than three hours. It is very hard to ensure the attention of an audience for such a long time, but the director, the cinematographer Caleb Deschanel and the main actor Tom Schilling have created such an effective work that you will "never want to look away." After growing up in Dresden, East Germany during the war, Kurt's adolescence coincides with the Soviet reign, resulting in another kind of suppression. He attends an art school in an atmosphere where art should serve the "high ideals of communism." Since his childhood, what he has witnessed is restricted artistic production and he is stuck between his own creativity versus what is "allowed." Struggling to follow his inner voice, he suddenly falls in love with Elizabeth, or Ellie, who resembles his aunt not only in name, but also in appearance. Unfortunately, Ellie is the only daughter of professor Carl Seeband, who ordered the sterilization and death of Kurt's aunt Elisabeth, a truth that is ever known to Kurt. A stern, disciplined and arrogant professor who hides his obedience to Nazism after Soviet control, and forcibly makes his own daughter abort her child, as he cannot accept Kurt as a decent son-in-law according to his "Aryan ideals." The two precious women in Kurt's life are victimized by the professor, maybe an exaggerated coincidence, but the audience never gets the expected flow of revelation and vengeance like many other films focusing on Nazi stories. Nor does Kurt become an angry and assertive man: he is always calm, understanding and naive as opposed to the villain professor who is tough, impenetrable and merciless. Another dichotomy is set between the artistic styles of East Germany and the West, which had already started to see the rise of avant-garde art in contrast to the infertile East German art restricted by political suppression. This is what leads to Kurt escaping to Düsseldorf, where he creates his unique artistic style in a much more independent fashion. Kurt and Ellie's time in Düsseldorf enables us to see the birth of German painter Gerard Richter's art, which inspired the director to create the character of Kurt. With his childhood memories of his aunt, war and own personal tragedies, Kurt creates his own success story out of old photos he turns into paintings with a touch of a blurring effect, which is to be marked in the history as Richteresque art. For those who are interested in seeing a realistic personal story which shows a perspective of the German art scene as influenced by political trends, the film is a must-see with the masterful touch of director Florian Henckel von Donnersmarck, cinematographer Caleb Deschanel and touching acting by Tom Schilling. Having debuted in Turkish theaters last week, "Escape Room" is cut out for the followers of the escape room concept. In recent years, the concept has become a frenzy for those who want to take a break from daily routine and experience a make-believe fear in specially-designed rooms that raise adrenaline levels. You are in a closed space and the only way out is a keyword you have to collect from your surroundings that have clues and hints in them. The good thing about the game is that if you cannot find the keyword, your time is up and you have to exit; however, in the film it is depicted as a real-life situation where you have to find the keyword or you die. Directed by Adam Robitel, the film depicts the non-stop struggle of seven players, who gather in a room to play for a prize of $10,000. They are specifically chosen by an unknown psychopath who knows of every detail in their lives. When things are out of control, they all understand it is a find-or-die play, and it is too late to run away. Each and every room is related with the trauma of a certain person in the group, and they are forced to relive their fears while, at the same time, using their brains and physical capabilities to the very limit. Players lose the game one by one, to define the "survival of the fittest," revealing their dark sides in the race to win and finding two surprise survivors who seem to have low self-esteem and courage. The weak side of the script is that it serves the cliche of thriller films: There are a few characters with stereotypical features who die one after another. The strong side is that it is nonstop action, supported with good shooting techniques, effective choice of spaces and well-arranged sound to accompany the thrill.